Though Anderson’s past collections held a youthfully eccentric cut-and-paste quality, this season was a collage of material all purposed to accentuate a frame or restructure a silhouette. Inspired by the stripping down of conventionally feminine forms, the designer built his collection around hyper femininity, picking apart silhouettes and putting them back together. What started as simple cinched cotton dresses quickly gave way to shapely layers of fur, feathers, and shearling. Silhouettes were either loosely voluminous, straight and waiflike, or draped and clinging and saw pairings of what the designer said “shouldn’t really work.” From feathers and cotton-canvas to chainmail and jersey, looks presented unlikely combinations that, even at their most random, radiated intent. Classic leather jackets were given a contemporary reboot with boxy sleeves and a cropped, curved hem parallel to the breastbone and just below the collar. Feathers, spliced into tulip skirts, kept the looks feminine while suede sneakers rendered them wearable and effortless. 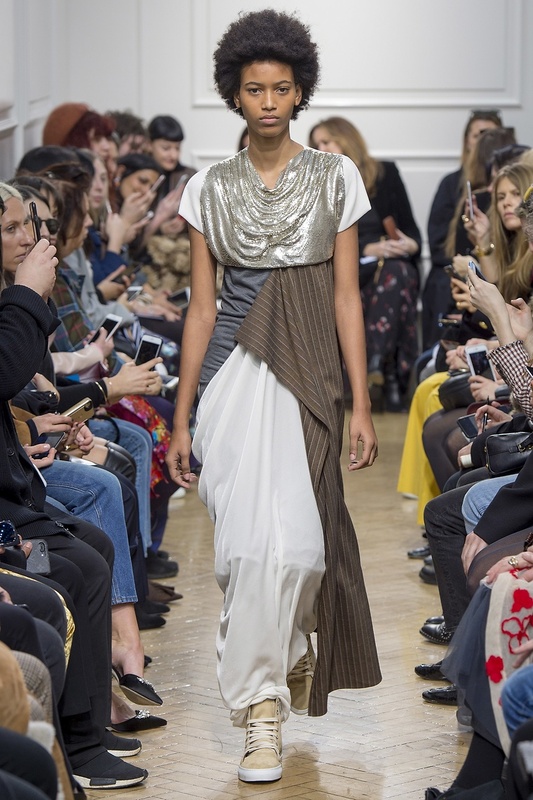 Metallics were a key part of the collection, as well, providing contrast to the array of neutrals with flat chainmail panels on tee shirts or hip hugging accents on flowing maxi skirts. Like an El Anatsui installation changes with each draped exhibition, a languid dropwaist multi-metallic mini worn by model Radhika Nair momentarily clung and conformed with her movements. or accessories, Anderson wove ribbons into his signature Pierce Bag and used slicked over side parts to reveal statement ear cages. Gilded, sculptural cuffs appeared throughout and square toed sandals and knee high boots complemented handkerchief hems and deflated puff skirts. Anderson’s last collection stood out from the rest with silhouettes constructed in multicolored macramé and larger than life knitwear, but both seasons have now seen the designer subvert conventions for traditional masculinity and femininity. "We cleared the slate and then built up the layers again," the designer explained backstage. Expectations for what defines womenswear have not only changed, but thanks to Anderson, some might say they’ve been raised.